A TEACHERS’ UNION president has explained why pay equality is so important for its members, on a week where both primary and secondary level teachers’ unions hold their annual conferences. A pay arrangement in 2010 put newly qualified teachers on a lower scale than their colleagues; around 75% of the cuts introduced at that time have now been restored since. Today, the Teachers’ Union of Ireland (TUI) president Joanne Irwin spoke to Morning Ireland and responded to questions about the pay changes that their members want. From a post-primary point of view, what we’re looking for is the restoration of the one common basic scale for teachers. What we’re not looking for is for someone who is starting out to be on the same as someone who is there for 20 years, but we’re looking for everybody to be on the same salary scale. 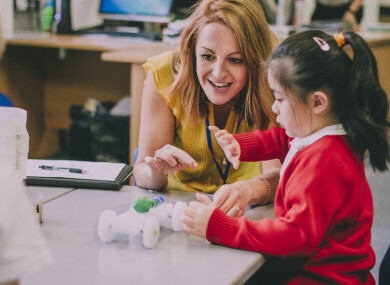 For primary teachers what we’re looking for is the reinstatement of a qualification allowance that we used to receive for the period of pre-service training, and which is now a two-year training programme. Irwin said that its membership of around 15,000 teachers and lecturers have already voted in favour of industrial action if pay equality measures aren’t advanced. The TUI are different in that we already have a mandate for industrial action on this issue, so if this motion is tabled at congress it is very clear that we will continue our campaign for industrial action up to and including strike action. Yesterday, teachers’ union the INTO said that if pay equality isn’t negotiated, that “members of the three unions will work closely together and we will be shutting down schools and withdrawing labour”. The gap has been narrowed but unfortunately had a disproportionate hit in terms of the public sector – in that we were hit in 2011 and hit again in 2012, and then unfortunately in 2013 for post-primary teachers they extended the training period to a two-year training on top of three- or four-year degree. We’ve been hit quite a few times. RTÉ’s Rachel English put it to Irwin that a newly qualified teacher earns €36,000 a year in their first year, which is more than “a lot of new graduates earn”. I think it’s important to point out that for teaching, only 22% of our recent or new entrants actually receive a contract of full hours. Only 22% receive that €36,000 – unfortunately there is a crisis in the recruitment and retention of teachers. She said that there had been a 62% drop in the number of those applying to become primary school teachers since the pay cuts came in 2011. “We have a concern about that,” she said, adding that many teachers don’t see themselves in that profession in 10 years’ time. Irwin was asked that isn’t it the same across all professions, that if people were asked would they stay in their jobs if they received a pay increase they would say ‘yes’. They’re not actually asking that they earn more, they’re asking that they be treated the same as their colleagues in the staff room. We’re looking for equality of treatment among all teachers. The TUI and the ASTI, which represent secondary school teachers, are to hold their annual conferences later today; the INTO’s conference began over the weekend in Killarney, Co Kerry. Speaking on Today with Sean O’Rourke, Bruton said that when he first took on the role as Minister for Education, “we negotiated an increase of between 15-22% for newly qualified teachers”. So now a teacher straight out of college is being recruited at €36,000, and that’s closed about 75% of the gap. He said that the government said there would be a process to reexamine this, and the Minister for Public Expenditure Paschal Donohoe published a paper on how this would be done across the public sector (teachers, nurses, and gardaí are among that cohort). Donohoe estimated the cost to the taxpayer would be €200 million. Public sector pay talks are expected to begin on 27 April. “I think this has to be dealt with across the whole of the public sector – it’s clear that new entrant pay is something that affected a number of grades [of the public sector]. We’ve always had a collective approach to agreements so that when people enter into agreements with the State regardless of whether they’re in a strong or a weak position, they get a fair deal. He said that over the past number of years, “more teachers have been recruited than in other grades”. Important to say that in the last two years, I’ve recruited 5,000 additional teachers – that’s more than has ever been recruited in the State before. The numbers show that students leaving college more of them are now getting work in Ireland and fewer are emigrating. He said that he recognises that there is a pressure in getting substitutes at primary level, and at secondary level there is “particular” pressure to get teachers in subjects like STEM, languages and Irish. Bruton added that work was ongoing to identify what resources were needed by the education sector before efforts were made to tackle the deficits. Updated at 10.55am, first published at 8.15am. Email “'We've been hit quite a few times': Teachers' union on why pay changes are needed”. Feedback on “'We've been hit quite a few times': Teachers' union on why pay changes are needed”.